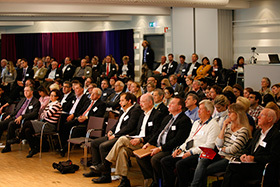 Since 2004, this Forum is an arena for idea sharing, learning and networking with a focus on the relationship between Sweden and the United States. A limited number of first mover tickets are 200 SEK + VAT. The Sweden-U.S. Entrepreneurial Forum provides excellent opportunities to meet smart people, learn from the best and get inspired to act. Participants at the Forum come from all parts of the entrepreneurial ecosystem. We want to bring together entrepreneurs, government officials, business angels, venture capitalists, bankers, service providers, students and researchers with the ambition to create an interesting exchange of ideas and experiences.